The controls seem solid and I've not had a problem executing any special moves. King of Fighters: Evolution brings new life to an annual series that was getting more stale with each new edition. When in Counter mode fighters do more damage, can perform desperation moves indefinitely, and can even cancel a special move into a desperation move. They also receive less damage from attacks and take no damage from any attack that's blocked. Evolution adds a few new characters and for the most part, they're not lame. .
Benimaru Nikaido returns with Kyo's student Shingo Yabuki, and are teamed with an enigmatic pair of fighters by the name of K' and Maxima. And you can't beat beating up a friend. I've not played this game for the original Playstation, but from what I've read the Dreamcast version is definitely the way to go, as it sports far superior hardware, 3D backrounds and more characters to select fr om. 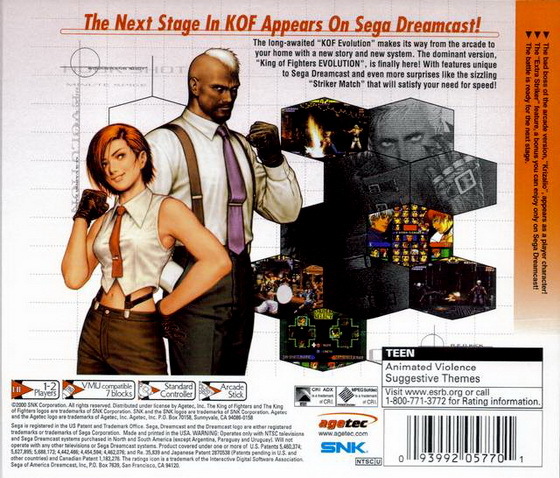 Unlike the last two tournaments, King of Fighters: Evolution would shed the media coverage in favor of the secretive matches of the tournament's origin. The first three characters selected are the regular fighters; they fight one by one until either the opposing team is totally defeated, or they're all defeated. The power meter can be charged up to three stocks, and increases whenever the character performs an attack or gets hit. Most of the familiar faces from previous tournaments return and are joined by some faces. The fourth fighter is the striker; this character doesn't participate in the fight itself but can be called upon a number of times to deliver some sort of special action. And I don't have enough time to extrapolate on the great fighting system, numerous endings ranging from humourous to somewhat serious. Could just be the animation switch gets blurred, but it happens. It gives modern fighting games a real run for the money. The 3D backgrounds are very nice, but imo it seems they paid more attention to those, and a little less to the actual character models. Tons of hours are going to be put into this game on my end, so having one that plays as smooth as this does is a big deal to me and this isstill the best version of '99 released so far. In Armor mode fighters do more damage and cannot be hit out of their attack animation. Each fighter has a health bar as well as a power meter. And in a departure from the established rules of the tournament, this time teams will be composed of four members each: three fighters and a striker. After the blast both Kyo and Iori were missing, and no trace of them could be found. This gives your team more flexibility to match up better against other teams. Don't get me wrong, it isn't horrible and is far from a game breaker. All things considered though, its a great fighter that offers a lot of fun and I would highly recommend it. Being a translation of the Neo-Geo game it really shows what you can do with ten year old technology. In its place players now have the in-game ability to go into Counter or Armor mode for a certain amount of time. The dual mode fighting system originating from King of Fighters '97 is gone. While it may look like any other King of Fighters game, Evolution adds some new gameplay elements to shake things up. It's 1999, a series of mysterious invitations have again gone out to the great fighters of the world. 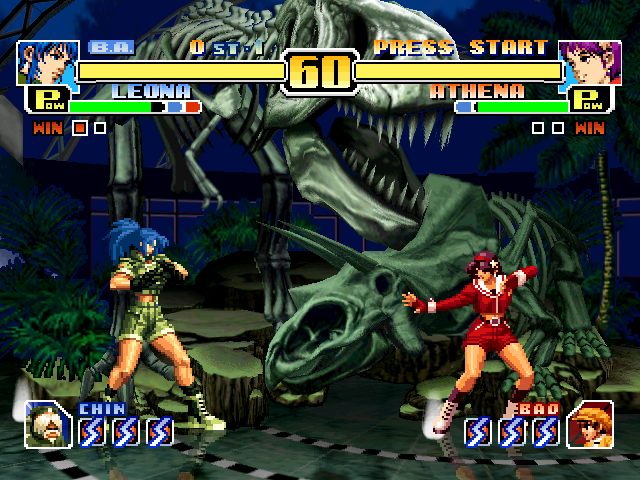 Players have a selection of seven teams of four fighters each plus a pair of single entries to choose from, giving the game a playable total of 30 characters. I have noticed that on hits sometimes the character who takes the hit gets super pixely for a moment. With the use of all three stocks fighters can enter Counter or Armor mode. 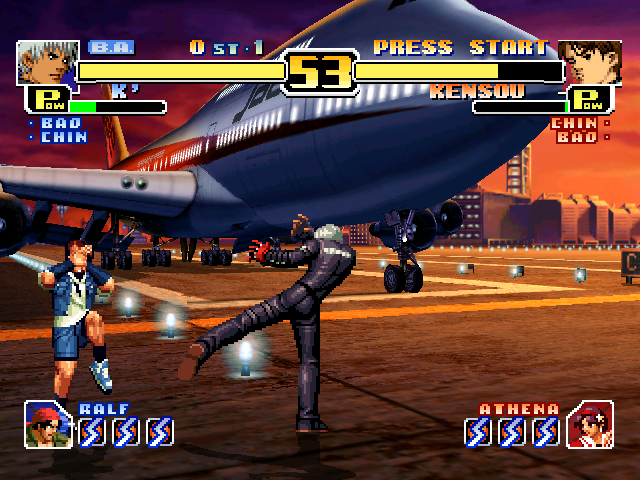 Fighters can perform their desperation moves with the use of one power stock; if their health bar is low and flashing they perform a super desperation instead. I've not played this game for the original Playstation, but from what I've read the Dreamcast version is definitely the way to go, as it sports far superior hardware, beautifully rendered 3D backgrounds and more characters to select from. While the game play is solid and the characters move fluidly, they are pixelated and low resolution. Evolution feels far more responsive than Dream Match '99 and moves are easier to pull off. 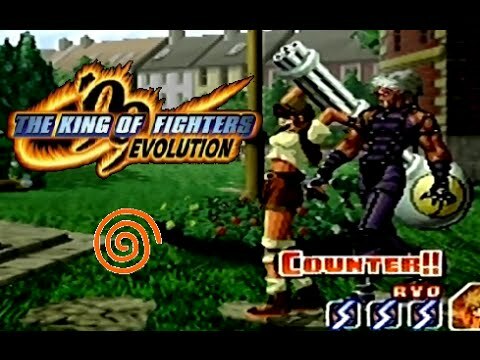 This is one of the best games in the King of Fighters series. I just prefer the slightly faster game play of the other titles. Regardless, its still a great title that offers a lot of fun and I would highly recommend it! Most notable is the switch from a 3-person team to a 4-person team technically 3 plus a striker or helper character which can be changed. Definitely the version I am going to use for my YouTube videos though and one awesome birthday gift. They seem to share Kyo's techniques, but aren't aware of his past. Although I would recommend this to any fan of Dreamcast fighters, I couldn't give it 5 stars because I just don't feel the graphics are quite up to par. A pair of mysterious Kyo Kusanagi look-alikes have joined the tournament as single entries. In fact, it is quite subtle and some may not even notice it! However, this offersthe ability to unlock Strikers which is an awesome feature. The controls seem solid and I've not had a problem executing any special moves. With the Orochi threat gone, everyone thought that the tournaments would end.